The Art Of Life: Claes Oldenburg At MOMA Claes Oldenburg is one of the best-known American pop artists. Critic Lloyd Schwartz found himself not alone in enjoying the current Oldenburg exhibit at the Museum of Modern Art, which continues through Aug. 5. 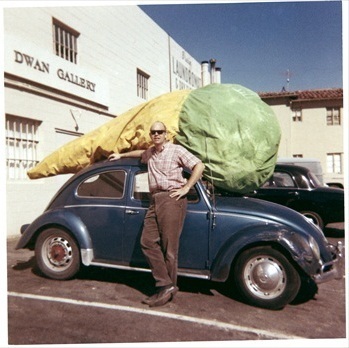 Claes Oldenburg with his Floor Cone (1962) in front of Dwan Gallery, Los Angeles, 1963. 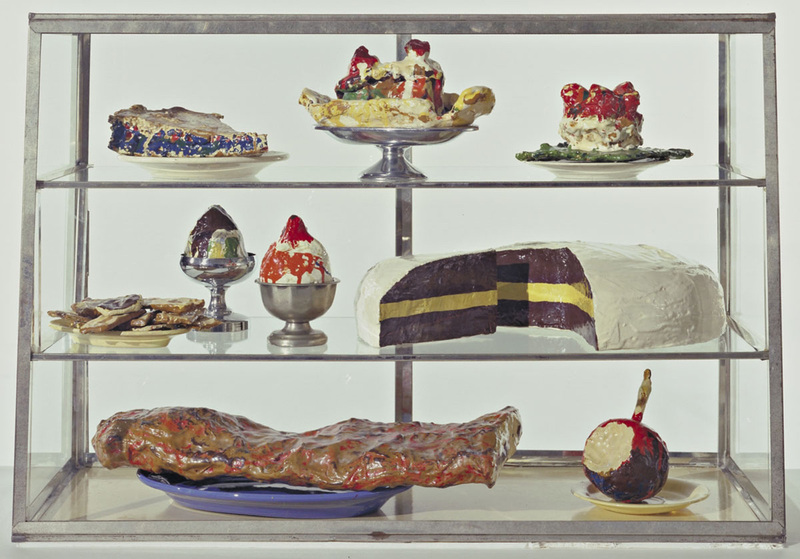 Oldenburg's fascination with simple, everyday objects often led him to food as a subject, as with Pastry Case, I, 1961-62. 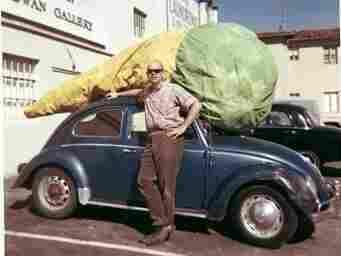 The sculptor Claes Oldenburg was born in Stockholm but grew up in Chicago, went to Yale and came to New York in 1956, where he became a key player in the pop art movement — the major counter-reaction to the abstract expressionism that dominated the 1950s. So much for art history. Although Oldenburg is a serious artist, probably no artist in history ever created works that were more fun. In a new show at the Museum of Modern Art — really two shows — practically everyone, including myself, was walking through the galleries with a huge grin. Though some of the images are unsettling: In the first and scarier part of the exhibit, the objects are from Oldenburg's 1960 shows called The Street — images inspired by his living on New York's Lower East Side. These are figures and objects, many of them suspended from the ceiling, made out of cardboard and burlap, nightmarish but also childlike, brown with black edges as if they were charred. There's a wall tag for a piece called Fire From a Window that took me a while to find, because it's a small board sticking out from the edge of a wall high up above the gallery — like a flame leaping out of a building. The second and larger part of the exhibit is called The Store, and these include some of Oldenburg's most iconic images from the early '60s. And here's where the smiles begin to widen. The objects are mostly plaster applied to chicken wire, or canvas stuffed with foam rubber — all sorts of things you can find in stores. Pants and shirts. Furniture. A whole lingerie counter with a mirrored top. And most deliciously, there's food. Glorious food. Succulent slices of pie and cake. In an exhibition-catalog entry in 1961, Oldenburg made a famous manifesto: "I am for the art that a kid licks, after peeling away the wrapper. I am for an art that is smoked, like a cigarette, smells, like a pair of shoes. I am for an art that flaps like a flag, or helps blow noses, like a handkerchief. I am for an art that is put on and taken off, like pants, which develops holes, like socks, which is eaten, like a piece of pie ... "
At the MoMA show, there's a huge 9-foot-long wedge of cake called Floor Cake sitting on the floor next to a 7-foot-wide hamburger, called Floor Burger, that you have to walk around. "I am for the art of underwear and the art of taxicabs," Oldenburg wrote. "I am for the art of ice cream cones dropped on concrete." Lying near the gigantic hamburger is the 11-foot-long Floor Cone. I particularly loved the small burlap and plaster Baked Potato, with its pat of melting butter, and the Banana Sundae, with its accompanying spoon painted with drips of enamel ice cream. An actor, Hamlet says, holds a mirror up to nature. 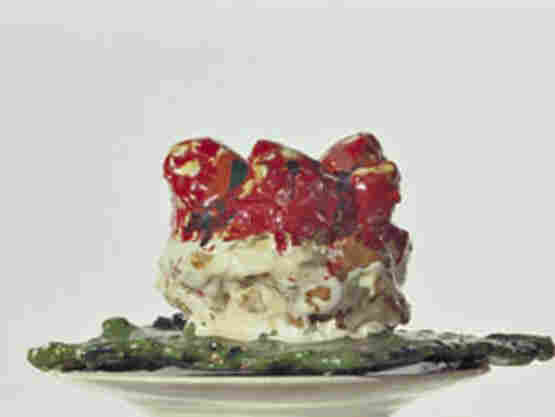 Just so, Oldenburg's art reflects the lives we live. "I am for an art that takes its form from the lines of life, that twists and extends impossibly and accumulates and spits and drips, and is sweet and stupid as life itself." It's both high tragedy and low comedy that for most of us our lives are so ordinary, that everything in The Store is for sale, our daily commerce. But that's part of the joy and pain of this wonderful exhibit that makes us smile so hard at the idea that our ordinary lives are so completely surrounded by, and enmeshed in, potential works of art.